Have you ever heard of a dead mammal exploding? 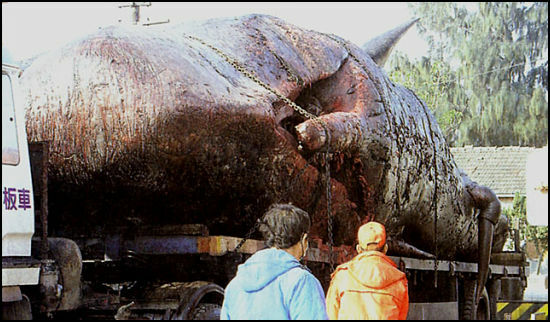 Well, yes, a whale had exploded in Taiwanese city while being delivered to a research centre near the south western city of Tainan. The whale, which had earlier died on the beach by the time help arrived, had been collected by researchers to use its remains for educational purposes. According to a marine biologist, the explosion had been caused due to the pressure from gases built up in the mammal as it had begun to decompose. According to Professor Wang Chien-ping, of the National Cheng Kung University in Tainan, despite the explosion, enough of whale had remained to be observed and examined by marine biologists. Moreover he also quoted that it had been the largest whale ever recorded in Taiwan with its weight of 50 tons and 17 meter-length. 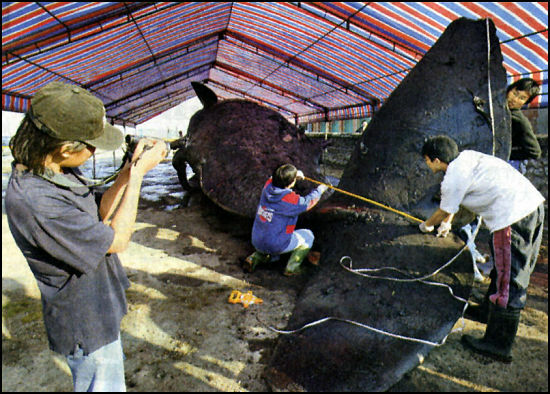 The professor had ordered the whale to be moved to the Shi-Tsao Natural Preserve after his own institution had refused to allow a post-mortem examination on its own premises. 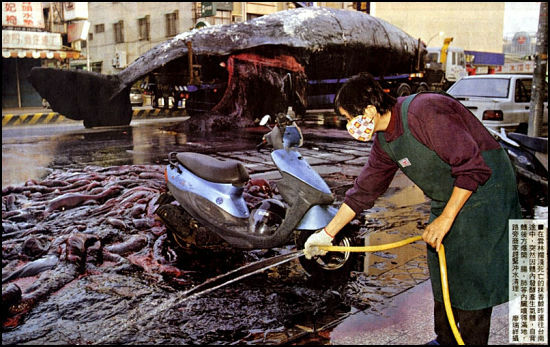 Thus, the whale had attracted a lot of onlookers before and after it had exploded. On its explosion, several parked cars and pedestrians had been covered in blood. In addition, the residents reported the blood to be a stinking mess, which was extremely awful and disgusting. Hence, the residents and shopkeepers had worn masks while they tried to clean up blood and entrails. As per the reports, it had taken 13 hours, three large lifting cranes and 50 workers to get the mammal loaded on the trailer truck for its final trip, because of its heavy size. Previous article Heracleion: A City Discovered Under Water After 1500 Years. Next article Vibrant Art On Excel- 73 Year Old Japanese Artist Tatsuo Horiuchi Creates Amazing Art On Excel!! Vibrant Art On Excel- 73 Year Old Japanese Artist Tatsuo Horiuchi Creates Amazing Art On Excel! !